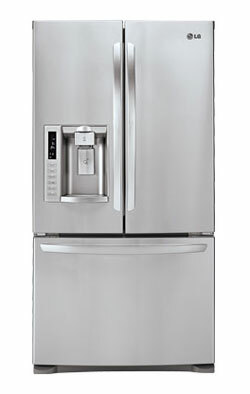 Overall: The LG French door refrigerator LFX28978 not only adds a great deal of looks to any kitchen, it comes with a great deal of function. The kind of storage space it offers should work for any family of 4-6 people as well as the extra features that will allow you to worry less about things breaking down quickly. Definitely a French door refrigerator to consider. Huge Storage Capacity: Not only does it store a great deal with over 27 cu. ft. of storage, LG was really thinking when they added a super slim ice system. This allows you to have a great deal more functional space in your fridge and freezer. Not to mention the 4 different compartments for storage of either fruits, veggies or meats. Linear Compressor: After reviewing as many refrigerators as we have the one internal thing that breaks the most besides the circuit panel is the compressor. This type of compressor should break down less often as it has fewer things to break and best of all LG is so sure of this that they cover your compressor for 10 years. Easy Ice & Water Dispenser: You may not have realized this but the ice/water dispenser is extra tall so that you can fill water bottles and pitchers with ease. Take it from us, a shorter unit becomes quite tedious over time. Colors: Smooth White, Smooth Black and Stainless Steel (that’s the one we’re reviewing here). We know that not every model works for everyone which is why always try to give you other possibilities in your choice. Take a look at the three LG refrigerators below.